This recipe is adapted from Sushma Soni, who runs a cooking class in Udaipur, Rajasthan, India. Make the dough: Pour the flour into a large bowl. Slowly add water and knead the mixture with your hands between each ½ cup of water to form a dough. Knead until the dough is medium-soft; it should feel like the consistency of your earlobe. Mix the filling: In a small bowl, combine the paneer, onion, mint, cumin seeds, garam masala, and salt. Assemble the parathas: Take a small chunk of dough and roll it out into a flat disk on a well-floured counter. Place a tablespoon of filling in the center of the dough. Pull the outer dough over the center to cover the filling and pinch it down with your thumbs to seal in the filling. Roll out the filled dough so it’s a flat disk again. Repeat until all the dough and filling is gone. Cook the parathas: Heat a dry skillet over medium-high heat. Place a single paratha in the skillet and cook for a minute or two on each side. 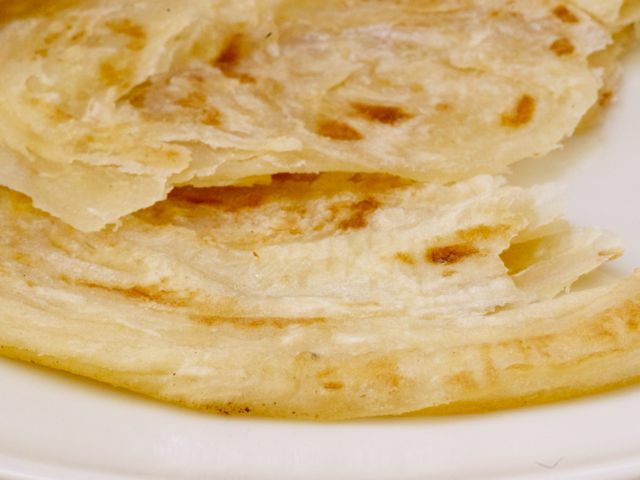 As the paratha cooks, brush melted ghee or butter on each side. Serve them straight from the skillet, or wrap the finished parathas in aluminum foil to keep them warm. You can buy paneer at any well-stocked South Asian grocery store, or you can make your own.